"K-LITE IS THE ONLY station in the history of CBS to repair itself without a format change," says AC KLTR Houston PD Ed Scarborough, discussing his station's turnaround since 1986, a rebound that took place with few staff changes. 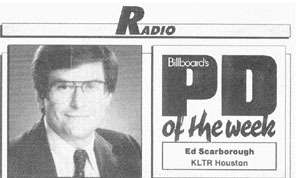 When Scarborough arrived from KKHR Los Angeles in 1986, KLTR was third out of four FM ACs and had dropped twoshares in less than a year. With KFMK, KJYY, and KQUE in the market - and KKHT set to join the AC fray a year later-K-Lite needed a fixed position. Scarborough's game plan was to first get KLTR's product "in line with our image"-one of a "friend" that a listener could relax with, or take to work. Then to turn the personalities from "background" into real people; emphasize music that appealed to the older end of his target demo; and market the station heavily. Since that time, however, KFMK and KJYY have gone oldies. KKHT is now Top 40 / dance KNRJ. And KLTR has risen 4.2 - 5.5 in the summer Arbitrons, up from a 3.7 two books ago. Scarborough grew up in West Hartford, Conn., started in radio during college, and eventually became MD of an all news station. "I didn't see much future in it." He went crosstown to CBS's KMOX-FM as PD, but his career really took off after the AC station became KHTR during a top 40's renaissance in 1982. "It's like we were on a rocket ship," he says of the station's dramatic 3.4 - 10.6 rise. "At that time, the CBS combo [KMOX/KHTR] had a third of the numbers in the market." But in 1983, Scarborough was transferred to Los Angeles, where "mellow rock" KNX-FM was about to become top 40 KKHR, and the rocket ride suddenly came to a halt. Facing KIIS-FM at its 10-share peak, KKHR was constantly outgunned by its rival. "We were battling a station that had a $3-million promotional budget," says Scarborough. "We had a $356,000 promotional budget, including TV. We went to war with rubber bullets." Still, Scarborough is quick to point out KKHR's achievements. "People often fail to realize that KKHR cumed over a million people in its first year, and that's amazing. We may have failed on the surface, but it's a miracle we kept it up for three years in that competitive environment," he says. to play anything so maudlin or deadly slow that it [under - mines] the benefits of listening to K-Lite. We watch the tempo of a song and ask ourselves if it fits the environ - ment of our radio station. Does it stand out in any way and, if so, is it in a positive or a negative way?" Two songs KLTR rejected, for example, were Gloria Estefan's "Get On Your Feet" (too uptempo) and Roxette's "Listen To Your Heart" ( "because of that heavy fuzz guitar" says Scarborough ). About 30% of the music heard on K-Lite is from the '80's, 50% is '70's material, and the remaining 20% is pre-1970. I Love You"; Rick Astley, "Never Gonna Give You Up; "
Just Called To Say I Love You;" the Beatles, "Michelle;"
and Expose, "When I Looked At Him." an allotted time, we'll send them two concert tickets anyway." Scarborough says the club, which now boasts 35,000 members; has been "a marvelous marketing tool." FLC promotions, according to Scarborough, are good for an automatic increase in TSL; cume is built by other means, including TV and mailouts to non-members. At present, KLTR does not really have a direct competitor: "Classic Hits" KFMK plays few currents; KQUE plays an odd mix of AC and adult standards; and easy listening KODA "has modified its music somewhat and is now stepping on our turf. force in the marketing of this radio station," the "brass"
this thing around," and KLTR's air staff.